Things have been busy around our place this weekend as three of us get ready for our upcoming road trip to LA. When we started out planning the trip we looked at various locales and tried to decide how we wanted to spend our two-week vacation. Favorites like Denver, Albuquerque and San Francisco were quickly replaced as we learned more about the 60th Anniversary Celebration at Disneyland…my daughters can be very convincing but, to be honest, it didn’t take much for me to agree to their plans. Seriously who wouldn’t want to see a bejeweled Sleeping Beauty’s Castle?! OK, I admit it…I am a Disney fan. When did this happen? How did this happen? While I can’t pinpoint the exact moment in my childhood when I decided that I wanted to be just like Mary Poppins when I grew up, I do remember the day I fell in love with Disney Parks. During that visit, we watched a movie about the development, saw a huge model of the new park and visited the park’s very first gift counter. I remember my brother and I put the jigsaw puzzle we bought that day over and over again! It was a map of Disneyland and we were determined to have the location of all our favorite rides memorized in time for our first real visit to Walt Disney World (it was only later during our visit that we realized some things are not in the same place at both parks). Another year passed and the Magic Kingdom opened. We could hardly wait for Dad to park the car so we could get onto the tram that would whisk us up to the gates. I couldn’t wait to walk through those gates and off to the magic beyond them. The excitement of visiting Cinderella’s Castle was almost too much to bear for my ten-year-old self and I wondered just how long it was going to take to get through the admission line. A picture that my dad took from the train station of Main Street U.S.A.
We finally made it through the front gates and joined the crowd of families walking through the tunnels under Walt’s railway. I have to admit only our dad really noticed the signs and posters on the walls – we kids were only interested in getting to the fun. And then we were there, walking down Main Street U.S.A. and seeing for the first time what Walt called the happiest place on earth…or at least the Florida version of it. Mom and Dad were amazed at the attention to detail on the storefronts, right down to the period signs painted in the windows. My brother and I were more interested in the delicious sweet scents wafting from the candy store. If you are lucky enough to walk by at the right time you can watch the candy makers at work. Of course, this was only after I had gotten to see the castle I had been dreaming of for weeks. Yes, this was the day I fell in love with the Magic Kingdom and all things Disney. A special place where family members young and old can have fun together and build memories that will last for years to come. I can’t wait for next week and the new, sparkling, memories that are yet to be made. Note: We’ve managed to visit Disneyland every June since I wrote this post. In fact, we just got back from there. It was our youngest grandson’s first visit! For more Throwback Thursday posts please visit Throwback Thursday Blog-Style. Next postIs Tiered Admission Pricing Coming to Disney Parks? 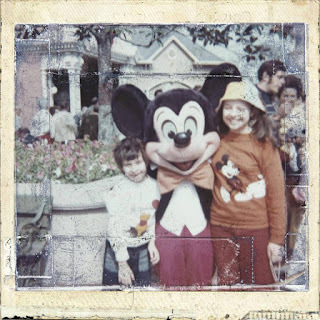 What a wonderful look back at your Disney park fun. I love that your Throwback Thursday had a vintage feel to it. How appropriate. So glad you shared that video, that was fun to watch. Oh, and thanks for linking back to my linky party. I really appreciate it. I hope you will have a chance to join in this week!